Our Ale Cask is the only Scotch to be finished in barrels that once held ale, giving it an irresistible creamy maltiness. To those who brewed the beer and built the barrels, we say #IOU. We wouldn’t have this amazing dram without you. We think a personal touch is important. That's why our Master Blender and his team journey to Spain each year to handpick the finest Oloroso sherry casks. That, and for the paella. The whisky is then finished in these special casks for months, giving it a truly distinctive, rich flavour. The perfect gift for a friend who knows you well, and likes you anyway. You have to have a pretty impressive nose to blend the finest whisky. Luckily for us, our Master Blender Brian Kinsman has just that. This very special edition is dedicated to his passion and craft, as he blends science with art to produce our iconic blends. In tribute to Brian, when enjoying this bottle with friends really get your noses stuck in. We think he’d appreciate it. 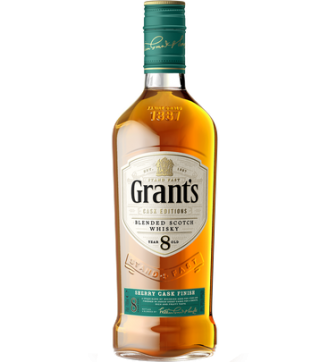 Grant’s 12YO is a masterful blend of malt and grain whiskies. After 12 years of maturation in oak casks it is finished in first-fill American whiskey casks, making it richer, sweeter and more syrupy. Nose - Starts with a sniff of Paper from a magazine, vanilla, honey and zest, ginger candy in addition to some smoke and tobacco leaves in the background as well as some pine leaves. Taste - Initial smoke boom (after the ale which had none! ), then malty sweet , some almond notes sherry too, green apples and honey. Finish - Malt, smoke, hints of tobacco box. The best things in life are worth waiting for. We mature the finest single malt and grain whiskies for 18 years (or longer) in oak casks and then finish them up in port casks. This creates a magnificent, perfectly balanced Scotch whisky with considerable depth of taste. How very sophisticated. Perfect for celebrating big milestone events with those that you’ve enjoyed the journey with. Like anniversaries, birthdays, and Thursdays. Our 25 Year Old Whisky is a truly unique experience. Discover a distinctive blend of some of the world’s best, rare and irreplaceable malt whiskies from now extinct distilleries. The perfect gift for someone with impeccable taste in whisky (and friends of course). Along with his team, our Master Blender, Brian Kinsman, wanted to see what would happen if we combined our traditional Scotch whisky blend with exotic flavours from the Caribbean. After many years ageing in oak barrels, our whisky is further matured in Caribbean rum casks for a smooth, rich and sweet taste. Our Master Blender, Brian Kinsman, chooses grain and malt whiskies matured in three distinct woods, similar to our Triple Wood blend. For this expression he ups the addition of peated whiskies for a smooth and fruity taste with subtle smokiness.